Ancola is a Redguard trader who has the stall outside the Gateway Inn in Sadrith Mora. 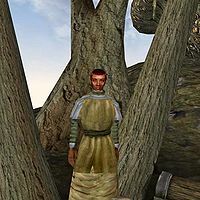 There she buys and sells a variety of goods, most notably bonemold and steel armor, ammo, and throwing weapons. Ancola wears a common shirt with matching skirt, and shoes. She also carries a steel club. This page was last modified on 7 February 2018, at 00:13.